Before you begin this very visual and user-friendly process, please note that preparing your customers and contacts data prior to importing is critical to the speed and success of the import itself. We recommend reading Preparing your Customers and Contacts Import prior to following the steps below to perform the actual imports. The article explains how to ensure that data you load into your customers and contacts import files are clean and organized, in addition to the importance of ensuring that the customer name referenced in both the customers and contacts import files matches exactly, which will keep all of the customer contacts within the same Mothernode CRM Customer record. The Import option in the upper-right portion of both the Customers and Contacts modules takes you to Step 1 of a four-part process to import your Customers and Contacts into Mothernode CRM. Click the download link on the Choose Data screen or click here for the Mothernode Customer Import Template, or click here for the Mothernode Contact Import Template. Once you have loaded your data into the template, save the file and click Choose a File or drag-and-drop the file into the shaded area to upload the data. Once the data file is uploaded, it’s important to ensure that the field labels in your import file (see row below labeled Source) match the Mothernode Customers or Contacts field labels (see row labeled Target). The Save New button to the right of Detect Fields allows you to save your import file as a template with the updated field labels, so you can re-use the template for future imports without having to manually map source and target fields. After confirming the mapping of source and target fields, click Review and Import in the lower right to perform a final review and complete the customer data import. 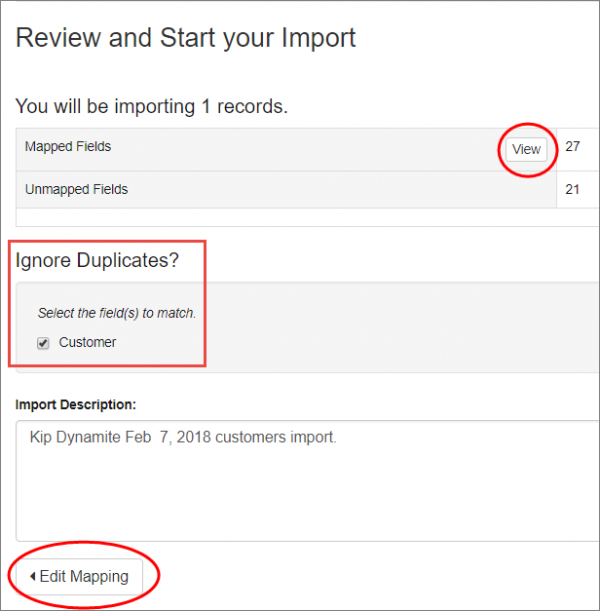 The Review and Import screen will confirm that all fields are mapped, or provide the number of fields that remain unmapped. Click the View button to see a summary of the mapped fields, and if any additional mapping needs to be performed, click Edit Mapping to return to the prior step and make the needed updates. Click Start Import in the lower-right portion of the screen to complete the import process. View Import Log provides a list of recent imports, with the option to Delete an import if it needs to be re-done for any reason. * Please note that any of the Mothernode CRM Import functions include an Import Log link in the upper-right portion of the screen to view imports and if necessary delete an import, and may also be accessed through the Productivity menu. Please see Undoing Imports for more information. View Records provides a view of the newly imported records as they now appear in Mothernode. Import Another File allows you to easily begin the process again if you have a new file to import. For example, you can select this option if you have completed the customers import and are ready to import your contacts. Once you have completed the import process for your customers, you will perform the same steps to import your contacts. The Import Another File option as noted above is one way to accomplish this, although you can also access the Import function from the Mothernode Contacts module. If you have accessed Import from a different module, simply ensure that Contacts is selected under Select Data to Import on the Step 1 – Choose Data page. For more information, please view our video tutorials Importing Customers in Mothernode CRM and Importing Contacts in Mothernode CRM.